Blast dirt and debris from condenser coils without damaging delicate fins with Condenser Needle. This product is designed to attach to a water hose and clean the backside of the condenser. It reaches inside most units without having to remove the fan blades and quickly cleans the entire coil bed. The patented Condenser Needle® coil cleaning tool (Patent #9,676,007) is perfect for condenser coil cleaning, if you have access to water. It quickly blasts dirt, debris and grime from condenser coils without damaging sensitive fins. Designed to clean condenser coils from the front and back, the Condenser Needle attaches to a standard water hose and comes with everything you need to get started. 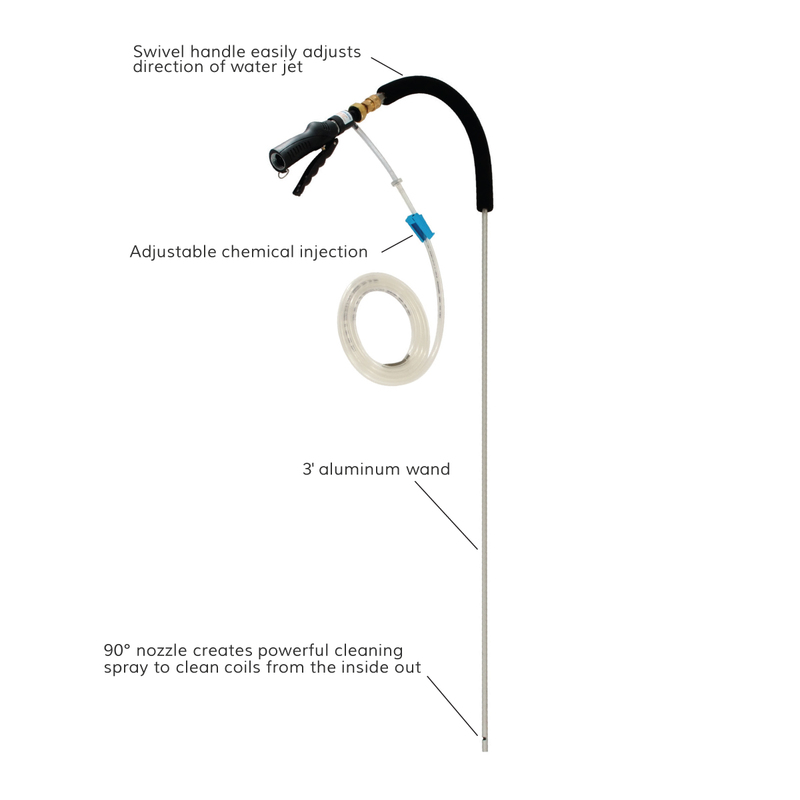 This condenser coil cleaning wand delivers a unique 90° spray pattern of water and chemical cleaner – up to 3 gallons per minute. 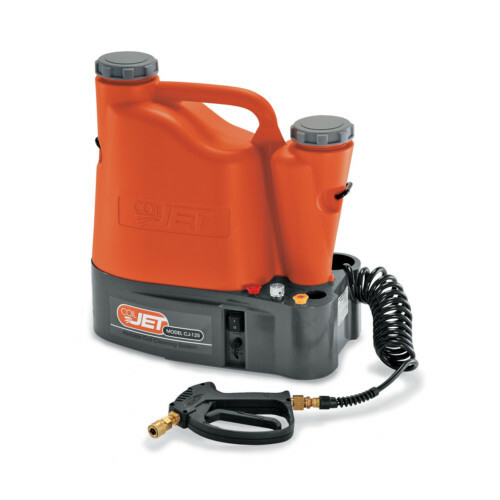 The water pressure won’t damage delicate fins and the spray angle virtually eliminates electrical trips and shorts – a common issue with power washers and spray attachments. Plus, its low profile wand slips through the top grates of most condensers, saving time from removing the top of the unit. 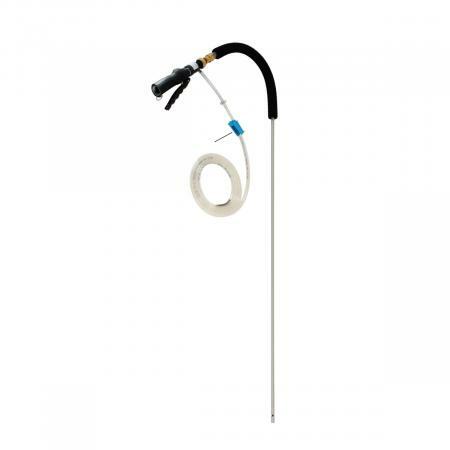 Condenser Needle also includes an adjustable chemical injection hose for use with SpeedyFoam®, an acid free, biodegradable foaming coil cleaner concentrate or other non-caustic, alkaline coil cleaners. Its super-foaming action captures and lifts even the most stubborn dirt and grime for superior results. Now with the Condenser Needle from SpeedClean, cleaning condenser coils is fast, easy, and efficient. 36″(l) x 3/8″(w) grade aluminum wand with commercial grade fittings. Connects to standard ¾” garden hose. Force dirt and debris from condenser units back in the direction it entered – a proven technique for increasing coil cleaning and system efficiency. 90° unique spray pattern and 3 gallon per minute flow blasts dirt and grime, won’t damage fins and virtually eliminates electrical tripping issues. Fits easily through the top of most condenser units, no more hassling to remove the top of the unit. Will the Condenser Needle® damage my coils? No! The Condenser Needle is specifically designed for thoroughly cleaning the delicate fins without damaging them. It does this by forming a unique spray pattern that never surpasses 100 PSI. Depending on the gauge of the fins and the angle of the spray, coil damage can begin occurring at only 125 PSI! What is the best type of coil cleaner to use with the Condenser Needle? 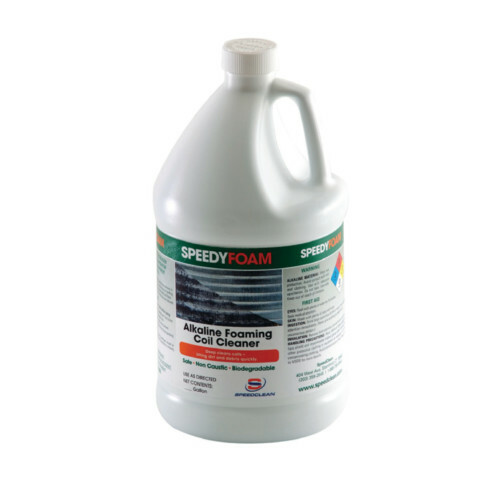 SpeedyFoam with ultra-foaming action from SpeedClean is recommended. It has superior foaming ability and is proven to be safe and effective. As an alternative, any non-caustic or non-corrosive foaming coil cleaner can be used. How long has the condenser needle been available to the non professional market?? CondenserNeedle was launched in 2008. Our primary distribution is through HVAC and plumbing distribution warehouses. Given our broad line of products that covers HVAC, plumbing and DIY users, we also make the CondenserNeedle available through our web site. This has been available since December 2009. Where can I find a copy of the user manual? I have lost mine. Thanks, Clarence. Thanks for the question. Manuals, MSDS and all other marketing sheets are available in two areas. One on the product page and the second on the product support page. Does a dirty coil cause frosting over of the evaporator? Yes, dirt and debris in the coil can cause frosting to occur as air flow is impeded. However there are other reasons, such a refrigerant balancing that can also cause frosting. clean your evaporator coils to see if that makes a difference otherwise contact a licensed HVAC contractor to review your particular system. 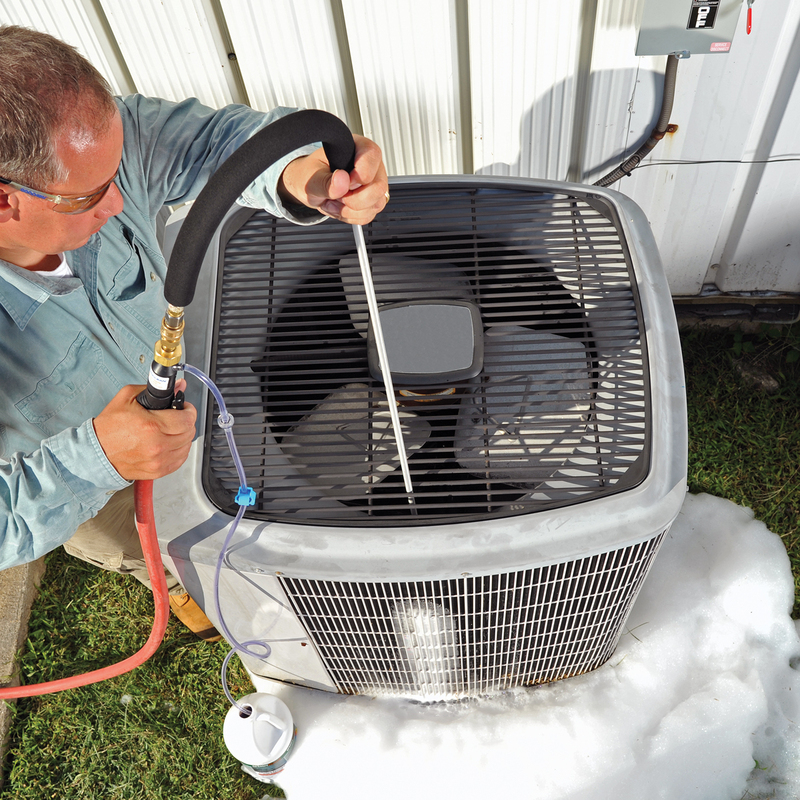 Can you clean the evaporator coil with the Condenser Needle? You certainly can, however it’s designed to clean coils up to 2″ thick. It only uses the power of the water pressure you provide and flows at about 3 GPM. If you need to clean thicker coils, consider our FlowJet coil cleaner system. It’s designed to clean coils up to 8″ thick.